Boom and Bust. Two banana eating monkeys driving trucks! No one is talking about what fragile pieces of new trucks are. It takes three trucks to keep two on the road. The only ones that can do that are big carriers that never actually buy the trucks but depend on gullible owner operators to buy them, which they aren’t. The entire industry relies on drivers working for free. It is this generations underground coal mining job. It is so bad they cannot pay people to do it. Automate it and good riddance. HA! Yeah, let me know how that (automating) works-out for you. So the automated (and assumingly more complicated new, newer trucks) will be more reliable and purchased by the big carriers now, which did not purchase them before? The workers will no longer be working for “free” but will now not be working at all? Also where coal miners replaced by automated workers while I wasn’t paying attention? Down here in Florida it is getting ridiculous. Insurance, repairs and tires are killing all profits. Many construction companies are buying their own trucks instead of hiring owner operators. In 2018 I paid $22,000 for an overhaul. $6800 for 8 drive tires and 2 steering. Because of the false claims the average insurance is $1700 a month. The pay to the truck averages out to $60 per hour, on a 8 hour day is $480. There is no travel time to and from the jobsites, 2 hours deadheading every day. Fuel is $120 a day. Minus $62.40 brokerage. That is $297.60 to the truck. If you have a flat or breakdown you might break even. There is no way you can buy a new truck at $180,000 base price on top of all the other expenses, and make a living. I Agree ,these Greedy Trucking Companies Shud Pay Better to Us Truck Driver’s Better! !…Too mouch Sacrifices For the Money!!!! Cass Freight Index does not cover bulk shipping. However, a good indicator of bulk shipping is the Baltic Dry Index. The index currently sits at a very low 629.00 points. This is 367.35 points below the 200 week moving average! Looks like bulk ship owners will be saving on fuel bills, demurrage fees, crew wages etc: For lack of any cargoes. Just one more fundamental proving the recession is here, with much, much more room to get much deeper. The problem with it is not so much a recession (albeit there’s definetely something’s up with China and especially Europe) but an enormous increase in cargo capacity. Yes, I did read your article last Summer. However I humbly disagree with your summation of the index, as not being a measure of global economic activity. It is still relevant as a trend measure, of the global economies health, which by it’s present standard is not good at the moment. Besides, it’s just one small fundamental (in addition to all the others) that gives you an image of what is coming. To ignore or dismiss out-of-hand, any economic signpost on your financial journey, could possibly put you in the poor house. Rio Tinto reported record sales of iron ore from their Western Australian mines in 2018 of 338 million metric tons, or up 2% from 2017. It’s likely 2019 will be no different, albeit a devastating fire in a huge Rio Tinto refining facility a month ago is likely to impact iron ore shipments. Yes, that’s the reason iron ore futures have been soaring, nothing more, nothing less. We know where the overwhelming majority of this ore goes and we also know all the talks about China “transitioning to a service economy” are just that: talks. Shipping companies do not care if the iron ore they deliver to Ningbo-Zhoushan is really needed for productive activities or is merely used as fuel for one of China’s many “corporate welfare” programs as long as they get paid. I do not mean to be disrepectful but like it’s often said that “generals tend to fight the last war”, people tend to see economic activity through the lenses of past cycles. But no past cycle has come even remotely close to the massive overcapacity we are seeing these days, of which China’s steel industry is the poster child. What we are seeing today is unprecedented, and Wolf is right to always suggest caution and then some more caution. Stockpiling commodity assets while shipping prices remain lackluster at best, because of an over capacity of shipping, as you pointed out. Picking iron ore out of the commodity sphere as a headline marker for the sector, is a very narrow view of the fundamental overall commodity scene. Which is now rolling over from down, to at best bottoming and is highly doubtful. Yes, caution should always be forefront. Not always possible with CB’s highly manipulating markets, which have destroyed any semblance of price discovery and risk. The world is in uncharted waters. “Unprecedented” to be sure. Historic times to be witness to. Good luck to you. Iron ore is over 29% (and heading to 30% if present trends remain in place) of the bulk trade tonnage worldwide. No other bulk dry commodity comes remotely close, and those that do (coal briquettes, non-ferrous metal ores and concentrates etc) can be shipped using the same category of ships. 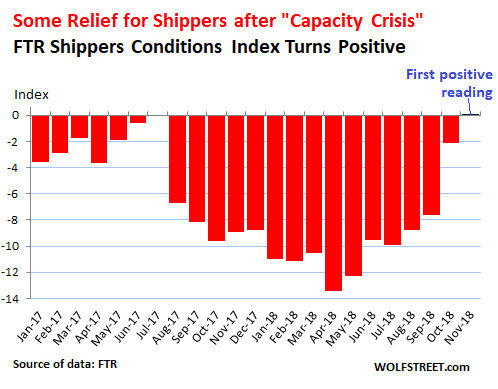 That’s why the Baltic Dry Index (BDI) is not the measure of economic activity it once was: one component is completely predominant, and shipping companies have built up massive overcapacity in that sector, thus driving shipping rates and hence the BDI down. This also means the BDI has become increasingly more responsive to what was once considered “background noise”, meaning rates for dry goods that make up (in tonnage) a small fraction of the worldwide sea trade, such as grains and even granulated sugar. The growth of iron ore tonnage in an age that’s looking towards different engineering solutions such as widespread use of light alloys and composite materials goes far beyond mere population growth, as unsustainable and irresponsible as it is. It’s the poster child for the unbelievable overcapacity built up worldwide, at the center of which sits China with all her “make work” and corporate welfare schemes. The first two charts can’t be correct as shown. Change is the 1st derivative of total orders. The first chart shows the 1st derivate negative for 3 months. The second chart shows the total orders but it shows 5 months of negative growth (same as 1st derivative). These two charts cannot be both correct. 1st chart negative is by year on comparison of total orders for any given month, second chart negative is observed on total orders compared to previous month. The first chart shows percent change for each month from the same month a year earlier. Jan 2018 = 37,200 orders; Jan 2019 = 15,642 orders; difference is -58%. And that’s what you see in the column for January 2019. Got it – thanks. Missed the fact that the first graph was change compared to a year earlier. Hope all these drivers are cracking the books and finding there next career , driving trucks will be a thing of the past before you know it. Paying someone $60,000 a year to hold a steering wheel is none sense and computers are much safer. Good luck drivers. Last I checked robots cant secure a load, unload, back in, drop a trailer, fuel, navigate city, dirt, or mountain roads. Cant pre trip, fix or maintain its self. We’re a long way away from this dumbass. Considering Class 8 trucks are usually a 5 year investment it’s going to be at least 20 years minimum for self driving trucks. Computers are not safer they crash all the time that’s the problem in the industry now people are counting on computers ! And they are not 100% that’s why accidents have gone up reliance on technology instead of soul and como n sense ! The real problem with computer driven trucks is the software. The computer is only as good as the programmers who create the software! If the programmers forget to anticipate every single possibility then bad things can happen! I have yet to meet such programmers! Most view others like engineers as idiots! Then of course there are morale issues! Does the computerized truck elect to kill people over not damaging the truck? From what little I have seen on these morale/legal issues those pushing automation have already succeeded via lobbying in having the state write new laws which basically say whenever there is an accident, the human driver is automatically at fault. I think we are a long way from resolving the morale/legal issues! Being Moral is good for your spirit. Good Morale is there being team spirit. P.S. I can see automated trucks on the lonely and empty stretches of well-paved and well-marked interstate highway that have been re-engineered to keep the sensors and software happy. Busy city streets during rush hour? Not a chance; not until the streets are re-engineered. But you know, on the East Coast they built special roads for cars but not trucks. Could imagine having separate road networks for robot vehicles vs. human-driven ones. So now people drive on a parkway, and park on a driveway. Wonder what will we call the roads that robots will drive and park on? One computerize truck wreck will make that $60k seems very cheap. I wouldn’t want to be around a computerized truck driving through tough winter weather. In that case avoid Germany: Daimler has had three self-driving semis in operation there for almost two years now. I always hope to see one when i am in the areas where they are said to roam, but so far no luck. Regulators require Daimler to have a driver on board (and rightly so: these are experimental vehicles after all) but the semis so far have been doing very well in all kinds of weather and situations. Daimler’s aim is not to go straight for a fully self-driving lorry, like Komatsu successfully did with mining equipment, but to start implementing a series of technical solutions to reduce driver workload and cut running costs and move from there. This is not so much because of insormontable technical issues but because Daimler knows fully well people are extremely opposed to self-driving vehicles because… well, nobody really knows, but I take it was the same thing when telephone switchboard operators were replaced by circuits. Telephone switchboard / circuits operate in very well defined, closed system with limited variables. Heavy transport operates in the open world in an environment with a huge amount of variables that will require massive amounts of computing power to enable it to operate entirely independently and make the required decisions, of which no two decisions are always exactly the same ….. it will be a while yet. MC01, data to back this up comes from where? You can bet Daimler won’t be telling you about all their issues. Is someone else tracking them and releasing independent data on how these trucks perform “in all kinds of weather and situations”? I don’t remember seeing people wanting a technology fail so badly since French/Italian consortium ATR introduced composite assemblies on airliners in 1984. At best it was considered an expensive fancy gimmick for military aircraft and at worst airliners loaded with nuns and sick children heading for Lourdes would be breaking up mid-flight all over the place. Now airlines and passengers cannot get enough composite assemblies in their aircraft: the former because of the conspicuous maintenance/weight savings and the latter because cabin moisture levels and air pressure can be kept far higher than in the past and hence make for less unpleasant long haul flights. A nice trucker just delivered 4000 lbs of hard maple flooring to my house from Quebec. He brought it into my garage and made sure it was set up in such a way that I could park one car. I’ll take him over the computer, thanks. Yeah, Bobbie. 60K a year is so much money for being away from your family for weeks at a time. If you think it’s so good why don’t you give it a try. Is there an expired tax deduction advantage now that the new year is upon us as well as a fear of economic decline? 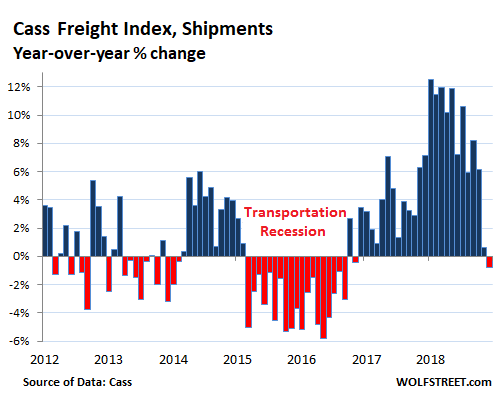 I find it interesting that the FTR Shipper’s Conditions Index is turning positive as the Cass Freight Index, Shipments, Y-O-Y Change is declining. Even though fuel price is down and capacity and rates are up you’d think declining demand growth would not signal improved conditions ahead. Especially since some of that increase in rates must be going to pay for increased capacity and demand growth is declining as capacity is increasing. Think that’s small misunderstanding OE…The ‘shippers’ in the FTR Shippers Conditions Index are not the transportation industry, they are the ‘people with goods to ship’. So as you said, they are seeing more capacity and lower costs hence to move to positive. Gosh, January is looking quite rough. US exports and Imports are down for 2 consecutive months. Class 8 trucks down and Baltic Dry down. Housing inventory in San Jose, Seattle and Portland spiking to multi year highs as per Redfin last week. And National New Home Prices at late 2014 levels. S&P 500 up 16% in 6 weeks. 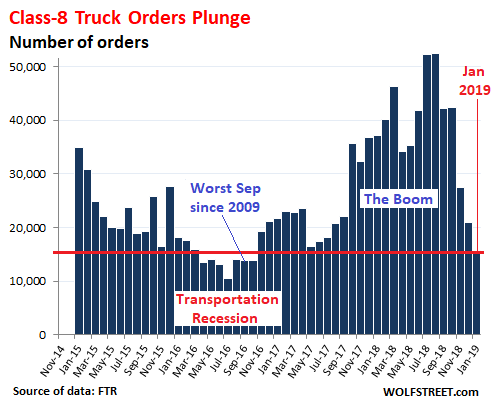 IMO, what’s not right: Real hard goods and services are hitting limits but the Fed has caved to the greed of the world’s elite and continues to maintain an inflated credit supply. In the Fed’s defense, a real clampdown, a la Volker, would cause real pain for everyone, not lust the elite, who would undergo actual individual suffering less than the so-called working people. Nailed it again. I have a man-crush on you. I’m driver. So what should I do? Should I quit or buy new truck? What about future of this business? The industry has survived these dips before. Trucks will continue to transport the merchandise to where it is needed. But things are just going to be a little less rosy. You might want to think about running your equipment a little while longer before replacing it. Once the backlog is gone, and truck makers have trouble keeping their plants running at full capacity, you might get a better deal. You are spot on. But If you have a little money stashed , the down turn is when to pick up some great used equipment. Still under warranty. Large trucking (transport) companies struggle immensely just to find drivers who can pass an initial drug test. A dedicated drug free responsible, professional driver today has no problem knocking down 100K gross annually. He/she will put in a lot of hours, but it has become a respectable wage job. I run I-65 regularly through Indiana. That piece of interstate has become 90% trucks and 10% cars. My very unofficial survey tells me that there is no shipping quantity decrease, but the age and condition of the trucks on the road is probably the worst I have ever witnessed. These new pollution controlled, computer laden tractors are in the shop a LOT. Whereas 20 years ago a corporate shipping company would think nothing of running a truck 1,000,000 miles, they are far more prone today to cash that truck out at 333,000 miles and stay under warranty. Initial orders may decrease, but production is going to be healthy just as long as we are able to skirt a recession. I sure wouldn’t short the industry quite yet. Wolf: on an entirely different subject, you might want to check out an article on today’s marketwatch.com about the number of large cap (over $10 bi) companies – 172 of them – who filed audited statements for 2018 between January1 and February 1 this year. – SIX! One time way back when I was still working and owned a few shares of Citicorp as it was then called, I actually opened the envelope containing the annual report, something I normally dispensed with. 67 pages of notes!! many of which told me, an investment professional,, nothing. 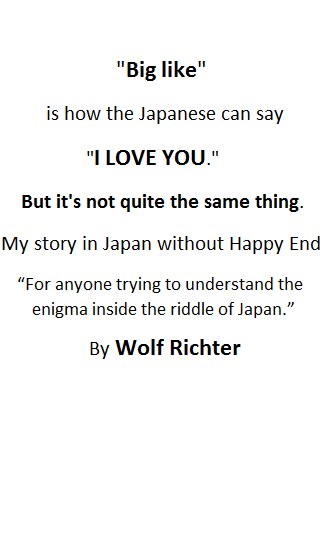 Right up your alley, Wolf. They’ll eventually have to file audited annual reports (10-K) or be delisted. They have 60 days to file them after their fiscal year ends. And they will file them on time. Companies don’t rush to get their audited 10-Ks out. They sometimes contain things that are not so good… with net losses often bigger, or net income often smaller, and so they drag them out. Quarterly earnings reports don’t have to be audited. Plus, it’s hard to get audited 10-Ks out at the same time as the speedy quarterly earnings reports. Audits take a while, and if there are issues that need to be dealt with, they can take even longer. I saw that MarketWatch article too and wondered about the title — how this year is any different from prior years (it didn’t say). That’s just always how it is. Every effort is being made by lots of companies to promote their hype and downplay or obscure any sense of reality. And this year doesn’t seem to be any different. The article was however a good reminder of how it is. Companies know that the media outlets don’t pay attention to 10-Ks and just focus on quarterly reports. So companies can disclose all kinds of stuff into their 10-Ks and it falls through the cracks. I have to believe that the highs over the last few years was partially from the smog rules California implemented… I watched my brother go through this with his fleet (5 total)… He finally found some used tractors that bigger companies traded in and was able to avoid buying new..
seems to me California has a stranglehold on the trucks from all over the US… Anything coming in to this state has to comply with our emissions…. It was definitely a struggle for my brother…Almost put him under. 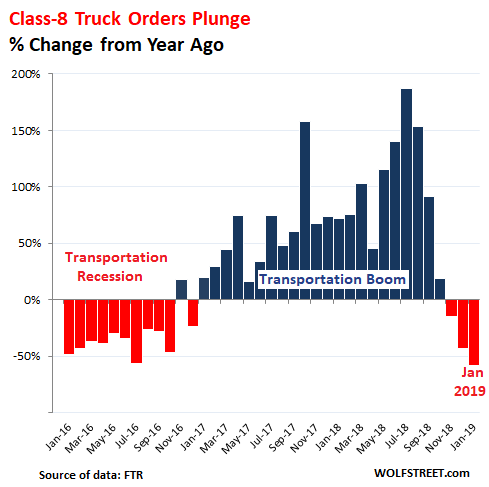 How much of this buying and selling relates to the number of old trucks being retired? These items have replace by dates stamped on them. Should we have an economic recession new technology will get pushed back, so driverless has to wait, and EV has to wait. Also energy costs are in a deflationary cycle, offsetting the need to upgrade with reduced operating costs to stretch the life of the existing fleet. Should be a few good years left for drivers, while domestic production replaces imports. People eat US produced food, build with US steel and lumber. (Housing gets more expensive?) Trade wars is now a fact of life. It cut down about 25 percent of productivity. Obviously,less productivity= higher demand for trucks and higher rates. Company started buying trucks and putting behind the wheels a “hwy killers”. Dont get sick If your a truck driver..if the doctor prescribes you any medicine and you have it in your system and have an accident..your liable to be sent to lagrange. But now,I might be mistaken. – A truck driving across continent is medieval form of transport. – Trucking will be replaced by trains (intermodal). The trailers will be loaded on trains and unloaded near the destination. – The last 100 miles (or so) will be done by truck (autonomous or man operated). – If delivery is to large business it will be done by autonomous truck, otherwise by local contractor driving legacy truck. – My heart is with these beautiful American trucks zooming thru mountains or deserts but the technology and economics do not have heart. Hey Carson! How’ve ya been? I gave you a load of rail last month, remember? I called you to send my (remote) location but you don’t have a smart phone, so had to give you directions. Before I had finished, you said “I know where that is” and hung up. When you were about 3 hours overdue, you called and said that I wasn’t where I was supposed to be. I said, “Well Carson, that’s an interesting perspective. I don’t have 30 years experience behind the wheel like you do, but my understanding of the trucking game is that you come to where I am, not the other way around”. So I had to drive a half hour to find you and guide you in. Then you spent about 20 minutes complaining about all the time and fuel you wasted looking for me. When your truck was half loaded, you said to stop loading because you could tell from your trailer that you had maxed out at 45K pounds. I told you that you currently had less than 30K and the last thing I want to do is go to prison for overloading a truck that kills somebody so I’ll be happy to show you exactly how I know exactly how much weight you have. You were not interested in seeing the math, so I told you that you had two choices…We unload and you leave, or we finish loading the full 45K. You mumbled something about where I could stick my calculator and got back in your cab.